Stef Bos was born in Veenendaal, the Netherlands on July 12, 1961. He moved to Antwerp, Belgium in 1984 and has been living there ever since. 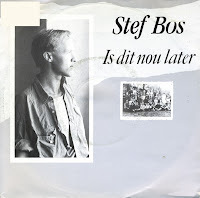 After working with Ingeborg on her 1989 Eurovision Song Contest entry 'Door de wind', he released his debut solo album 'Is dit nu later' ('So is this later') in 1990. The title track was his debut single. The lyric of the song is based on the idea that children are promised that the world is at their feet later, when they're all grown up. The singer states that his diploma is full of lies, stating that he's an adult who knows the truth, when in reality he doesn't understand life at all. There's an anger in this song that I've always been able to relate to very well.